On Wednesday, 21 September, 2016, the Adani group launched the largest single location solar power project in the world. The group which has interests in ports, edible oil and energy entered the solar sector around two years ago. 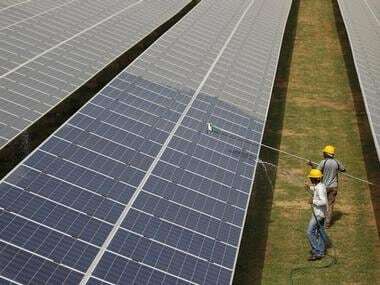 It began with what was then India’s largest solar power plant (located in Gujarat). It now boasts of having the largest single location solar power plant in the world. The new project's operations is located in Kamuthi in Ramanathapuram district, Tamil Nadu. It is being undertaken by Adani Green Energy (Tamil Nadu), the renewable energy wing of the Adani Group. The new plant has a capacity of 648 megawatts (MW) and involves an investment of around Rs 4,550 crore. 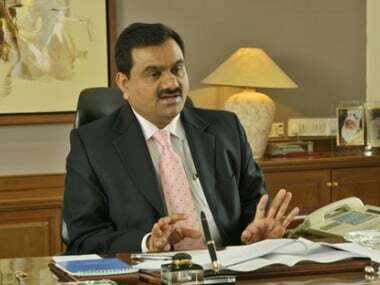 “A plant of this magnitude reinstates the country’s ambitions of becoming one of the leading green energy producers in the world,” said Gautam Adani, Chairman, Adani Group. Around 8,500 personnel worked to achieve an average of around 11 MW of installation a day, to set up the plant in a record time of 8 months. The solar power plant is part of the state government’s plans to generate 3 GW of solar power inline. 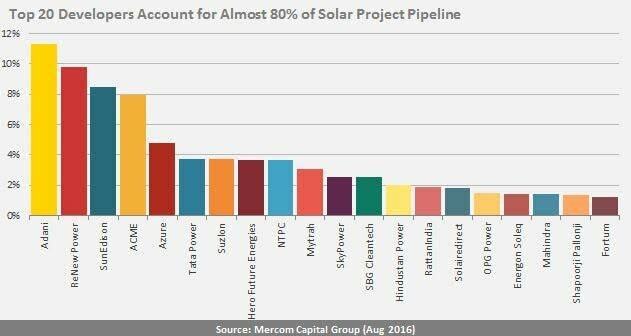 The Adani group, according to a Mercom report, accounts for an 11 percent market share, with a cumulative solar power generation capacity of around 2 GW (see chart). It is followed by ReNew Power (a wind and solar company backed by Goldman Sachs) with a 10 percent share. “Soon to be acquired SunEdison has around 8 percent of market shares,” explains Priyadarshini Sanjay, managing director, Mercom Communications India. “ACME has around 8 percent, Azure around 5 percent, Tata Power 3.8 percent, Suzlon and Hero Future Energies have 3.7 percent of the large-scale solar market each. Thus, the top 20 developers account for almost 80 percent of projects under development,” he adds. With India deciding to source 40 percent of the 100 GW of power through rooftop solar, this is another segment that is bound to be extremely interesting in the coming years. This is because rooftop solar involves almost no land acquisition cost, and little transmission cost (because the distance between the solar panels to the consumers is the shortest). Tata Power currently has the largest solar installed capacity in India with approximately 9 percent. It is followed by ACME with 7 percent and SunEdison with approximately 5.5 percent. The Adani group accounts for 5 percent. 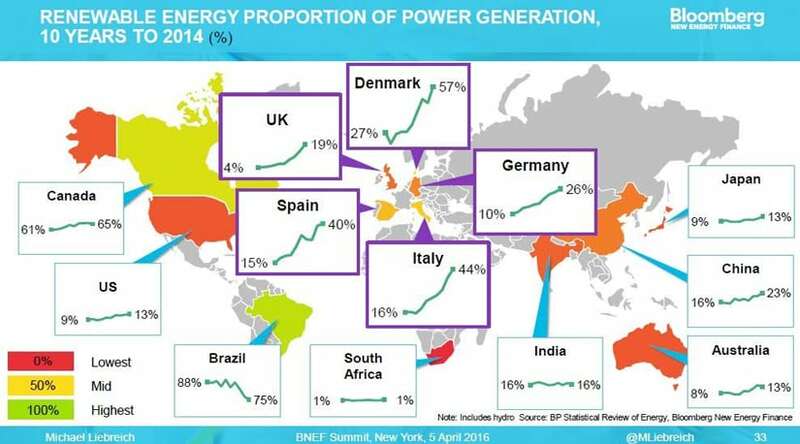 Even globally, solar power has taken centre stage. This is underscored by by Michael Liebreichm, Chairman of the Advisory Board, Bloomberg New Energy Finance (BNEF), in his ‘state of the clean energy industry’ keynote address at BNEF’s Future of Energy Global Summit in New York, earlier this year. The conference’s underlying theme was stark and simple: “Coal and gas to stay cheap. But renewables still win the race on costs”. In fact, many countries the world-over will see the share of renewable energy (a bulk of which will be solar) rise over the next decade (see chart). But solar will be the darling investment area for the world. 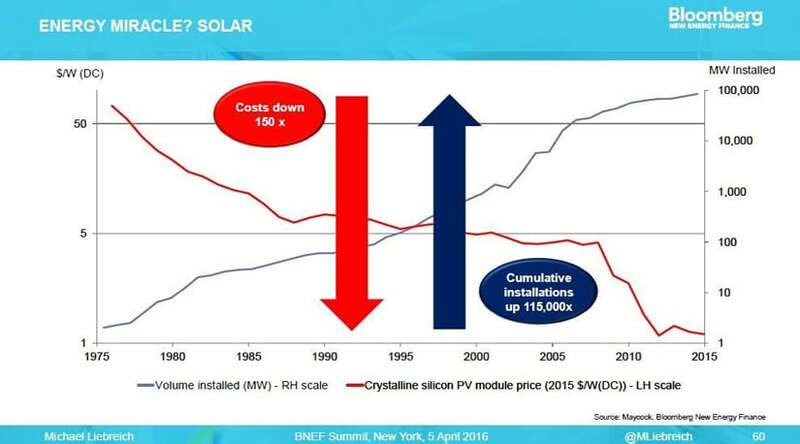 This is because as Liebreichm reiterated at the conference, sustained long-term deployment programs had transformed the solar industry. “We’ve seen the costs come down by a factor of 150 since 1975. We’ve seen volume up by 1,15,000 . . . . . How much more miracle-y do you need your miracles to be?” (see chart). Solar is obviously the way to go in the near future. Solar (and wind) power will be aided by one more factor – falling battery storage costs. Experts believe that battery costs could fall by 75 percent by the end of next year and by 90 percent by 2030. It is the falling cost of storage that takes away the uneven generation of power from wind and solar panels. A little change in the velocity of the breeze, or a cloud over the sun can disrupt power generation. Nobody likes depending on power that is unreliable, flaky and intermittent. Hence a storage device which takes in the power, and then releases it as a steady stream is absolutely essential. Falling battery costs could increase the pace at which renewable installations take place. In fact, India has advantages that escape most other countries. If solar could work in Germany, surely it could work in India which has more sunlight. And since Germany had shown that solar could create many jobs (Germany today employs more people in the solar sector than in the automobile sector). This author began championing the case for solar power as early as 2005 and wrote about it in 2009. That was when Germany had already startled the world with its foray into solar power in a very big way. Then came Brightsource, which threatened to change the course of solar power using concentrated solar power (CSP) mirrors. Butr the technology was too expensive. And finally, there was Desertec, which had great plans, but floundered mostly because of political factors. Desertec proclaimed on its website, around 2005 itself, that “within six hours the deserts receive more energy from the sun than humankind consumes within a year”. The plan was to harness the sun in the deserts and send the power all the way to Europe. India began to embrace solar power with its Jawaharlal Nehru National Solar Mission (JNNSM) in January 2010. The target was 20 GW by 2022. On 17 June 2015, the Modi government upped this target to 100 GW (by 2022). The markets gasped. Will it be possible, they asked. So, did this author. After all, even by May this year, the country had installed just 6.76 GW of solar power capacity, against the target of 100 GW. And who would meet the financing costs? Why was the government not moving in aggressively on the rooftop solar front, so that the cost of land acquisition could be eliminated? Then came the announcements on 10 June 2015. Upendra Tripathy, secretary, ministry of non-conventional and renewable energy announced that the government would source at least 40 GW through rooftop solar. Factories, commercial establishments and government buildings would also be encouraged to set up rooftop solar power capacities. Solar would be the route the government would adopt for rural power as well. After all, setting up transmission lines to remote villages can be prohibitively expensive. This then leads to three types of losses. First, there is the transmission loss. The longer the tramission line, the greater the loss. Then there is theft, often mis-declared as agricultural power consumption, or as losses. The third is theft of the copper cable itself. Using decentralized, cluster, off-grid solar power generation stations could be the way to go, admit MNRE officials. The Adani project is thus a major landmark for solar power installation in India. But rooftop solar could be the way to go in the coming decade.